Obituary – Merriman, Irene Margaret (Kirtley) « Perry High School Alumni Association, Inc.
﻿Memorial services will be held at 1:30 p.m. Thursday at the Osage Christian church at Tulsa for Mrs. Irene Margaret Merriman, 65, Sand Springs, formerly of Perry. Burial will be at 4:30 p.m. Thursday at the Polo cemetery, northwest of Perry, under direction of the Dodson-Mobley Funeral home of Sand Springs. Parker Funeral home is in charge of local arrangements. Mrs. Merriman was born to Charles and Frances Jane Kirtley at Enid, Aug. 22, 1912. 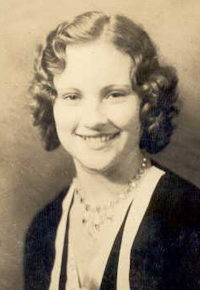 She grew up in the Perry community and moved to Tulsa after her marriage to Phillip Merriman. In addition to her husband, survivors include two daughters, Barbara Manning, Tulsa; and Pat Giddens, Plano, Tex. ; a son, Phil Merriman II, Tulsa; her father, Charles T. Kirtley, 514 Eighth street; five sisters, Mabel Beasley, Duncan; Clara Pantier, Shawnee; Mary Bocox, Medford; Janice Endres, Edmond; and Alice Koch, Perry; three brothers, Larkin Kirtley and William Kirtley, both of Perry; and Phillip Kirtley, Sulphur; and seven grandchildren. Mrs. Merriman was preceded in death by her mother, Frances Jane Kirtley.